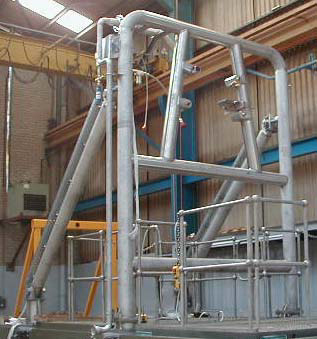 C F Baker specialises in the design, manufacture and installation of high quality structures in stainless steel, mild steel and aluminium. Do you need high quantity batch work or a one-off prototype? Whatever your metalwork requirements, we will produce a tailored solution manufactured to the highest standards. C F Baker's hugely knowledgeable and multi-disciplined team have a superb track record in producing first-class results across a wide range of industries. All of our people - management team and shop floor - share a refreshing ‘can do' attitude towards even the most complex of challenges. Our metal fabrication capabilities are backed by full ISO 9001:2000 accreditation. a nationwide delivery service - terms by arrangement. Please tell us what you need and how we can help you. Call 01923 816062 for a no-obligation discussion with one of our specialists. Please click here to see examples of C F Baker projects. © Copyright C F Baker, 2004 - 2007. All Rights Reserved.